As the summer draws to an end, my mood has started to take a nosedive. I’m so not ready for my long days of doing nothing to end. But just because my psyche is plummeting, the hot, Texas heat is not following suit. So here’s one to cool you off as these last days of summer wither away. The refreshing, non-alcoholic cocktail also has some health benefits. (I can’t say the same about the alcoholic version for sure…) Pomegrantes are loaded with healthy antioxidants. *They are a good source for vitamin C and potassium. Juice of the pomegranate has been found effective in reducing heart disease risk factors. 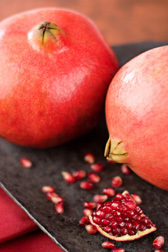 Pomegranate has also been shown to reduce cholesterol and systolic blood pressure. It has also been proven to reduce stress triggers and as having antibacterial effects against dental plaque. While the fruit is available during the summer (normally available from September to January in the Northern Hemisphere and March to May in the Southern Hemisphere), it’s juice is and it makes for some great cocktails. So drink up. Mix juices and sugar briskly until sugar dissolves. Wash oranges and berries and cut them into thin, round slices. Remove kiwi skin and cut into thick, round slices. Place all fruit into your juice mixture and allow the flavors to blend in fridge for 2-3 hours or overnight, before serving. 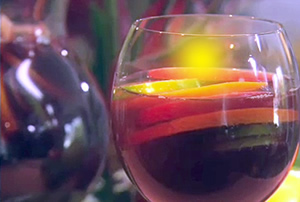 Serve in individual glasses, garnished with fresh fruit slices. In a pitcher add orange, lime, apple and cover with red wine, rum, orange liqueur, orange juice, pomegranate juice and stir in sugar. Chill in the refrigerator for about 3 hours. When ready to serve top off with club soda, to taste. Enjoy! You can add any fruits and berries that you wish. Try strawberries, pineapples, and mangos. Yummy! As women, we have many things to worry about when it comes to our bodies. One of the most dreadful, life altering of these things is breast cancer. As I read across the blogosphere, I came across a post about a mother who had an egg-sized lump removed from her breasts. She’d done monthly self-exams, but apparently the lump was in an area where it went unnoticeable until she became pregnant. Fortunately for her, the lump was benign and she had it removed with no problems to her health. However, every day, women across the world are dying from breast cancer. This post touched me. So much so that I decided to share, with her permission, part of her posting. The part that I’m posting was actually taken from another blog that she’d read. The post is written by a fellow mom of two boys. She is fearlessly fighting a form of breast cancer that I didn’t even know existed until I read her post. Applaud her courage. Say a little prayer. Hug your children just a little tighter. Now take a look and pass it on. Consider it your good deed for the day. “We hear a lot about breast cancer these days. One in eight women will be diagnosed with breast cancer in their lifetimes, and there are millions living with it in the U.S. today alone. But did you know that there is more than one type of breast cancer? Please, remember to: perform your own monthly self breast exams. We know that survival rates are much higher the earlier it’s discovered. Have regular, annual visits with your OB/GYN.